Pearl Hart, Arizona’s best known female outlaw, was held and tried in the Pinal County building for her infamous stagecoach robbery. That same building provided the backdrop for the sanity hearing of another notorious woman, Winnie Ruth Judd (aka “The Trunk Murderess”), who was convicted of a gruesome double murder. Today, visitors stop in to see the restored Historic 1891 Pinal County Courthouse. Florence, Ariz., is the Pinal County seat and boasts 124 buildings on the National Register of Historic Places. The courthouse, which was first added to the National Register in 1978, is the dominant landmark in town. The American-Victorian style building is perhaps the most architecturally significant and recognizable landmark in all of Pinal County. Until its recent renovation, it was rapidly deteriorating. A crumbling brick exterior, longstanding roof leaks, asbestos and lead paint were a few of the reasons the building sat unused since 2005. Immediately adjacent to the board’s existing space sat the unused, historic courthouse. County management studied an earlier architectural assessment that identified, in painstaking detail, what it would take to renovate the 1891 landmark. The total cost was $6.6 million, but the bigger price tag meant bigger rewards for the county. In renovating the courthouse, the county would preserve a building older than Arizona’s statehood. 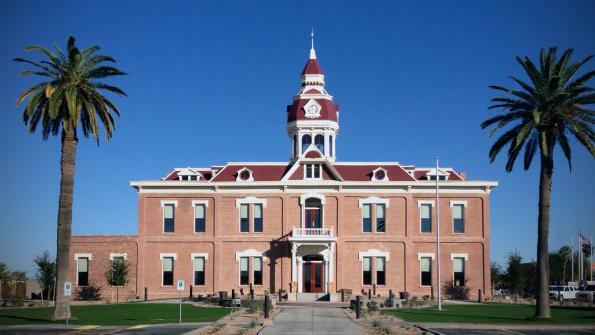 In January 2011, the board of supervisors agreed to renovate the 1891 courthouse using a combination of existing reserve funds, plus the earlier plan’s $3.2 million budget and up to $2.8 million in one-time, non-recurring funds received through the American Recovery and Reinvestment Act of 2009. Demolition and asbestos remediation began in summer 2011 and the reconstruction and renovations were completed in December 2012. Pinal County’s team to complete the renovation included Arcadis, Swan Architects and Concord General Contracting. The companies employed a team of primarily Arizona-based workers and craftsmen at a time when construction jobs were few and far between. Key interior architectural features include a pressed tin ceiling, a dramatic grand staircase, plaster walls and intricately carved door hinges. Topping the building is a prominent clock tower featuring ‘fish scale’ metal cladding, ornate details and glass windows. The renovated courthouse serves as the headquarters for the board of supervisors, offices for four other departments and houses the main board hearing room. It also boasts community meeting rooms and a ceremonial courtroom on the second floor for weddings and other celebrations. *During the extended period of non-use, bats found the building’s dark and quiet interior to be a hospitable place to roost. Since reopening, a few bats have had to be escorted off the premises.